Designer goods go on promo at Shopbop, delighting us all! My shopping season is kicking into high gear thanks to all the fantastic promotions going on. The latest? 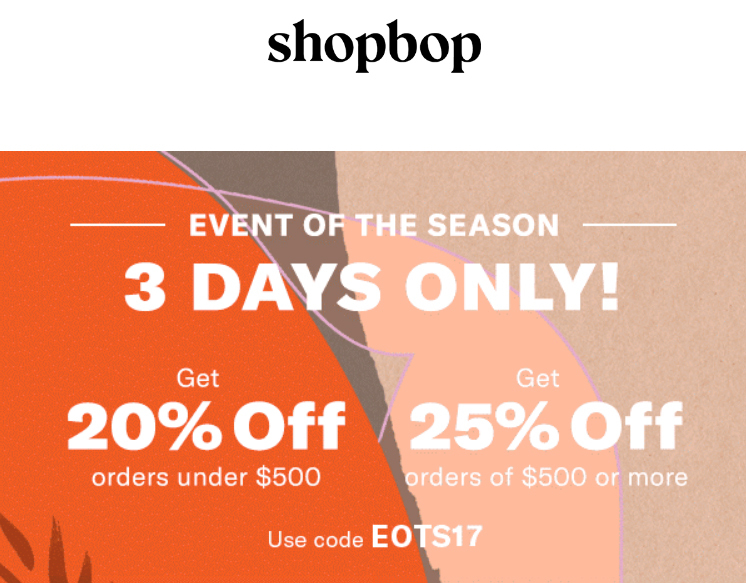 Shopbop has brought designer delights into closer reach with their Event of the Season, where you can take 20% off all orders or 25% off orders of $500+ with the code EOTS17. This week is shaping up to be a big promotion discussion week here on Effortlessly with Roxy, and probably most of the period from now through January 2018 will be this way. A quick reality check: no one can afford everything they want. I am not going to pretend like I’m going to buy from every sale or promo — there’s just no way. As a blogger I’m going to lay out lots of fun and fantastic shopping ideas and cover as many promos and retailers as I’m interested in. For you as a consumer I’m presenting tons of options but of course there is no requirement to buy, ever. No one wins a prize for wearing new stuff every day. This particular sale is going to get a chunk of my shopping budget because there are many pieces I’ve had my eye on, which we’ll discuss further down in the post. Whether you’re making a dream wishlist and playing along or planning to shop, this and all my posts are meant to be fun explorations rather than peer pressure cookers. On my Fall purchasing list was a pink bag, and I’d been looking towards Rebecca Minkoff’s Small Love Bag ($195-$245 + up to 25% off) to fill that hunting request. 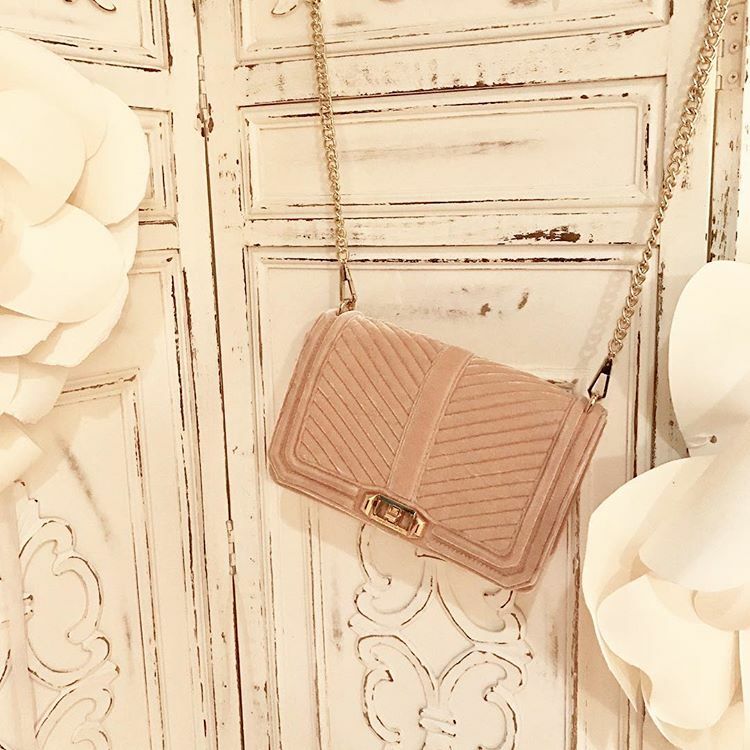 This bag has more than a vague resemblance to Chanel’s famous purses but at a fraction of the price. As Céline and Chloe tend to get my designer dollars, this is an ideal solution for me to stay on shopping budget right now. My initial thought was the quilted chevron version (above) but as time went on I realized a leather bag would be more classic. So my first purchase in this sale was the leather version in beautiful vintage pink, which you can see on my Instagram later today. This cute bag comes in everything from a gorgeous dark cherry leather (also in quilted chevron) to classic black leather or flower-adorned trend pieces. The bag is also available in different sizes all the way up to jumbo. On the more non-sensical side, at this point I have a generous collection of leather and faux-leather jacket. If you’ve been reading this blog for any length of time you probably know that I adore Rebecca Taylor, and especially the brand’s leather jackets. I already own the Washed Leather Jacket ($895 + 25% off, on me here), and now I’m also buying to try the Washed Leather Moto Jacket ($950 + 25% off, above left). I adore the color and the bracelet-length sleeves! I must have also subconsciously picked up on the dress Shopbop paired with it, because I’ve also gotten the Short Sleeve Capucine Dress ($395 + up to 25% off) and the Floral Jacquard Bow Top ($295 + up to 25% off) to wear with the jacket. (I’ll wear the latter with jeans.) I’m very excited about the possibilities for the jacket! Other recommendations from this sale? The BB Dakota Wade Faux Suede Jacket ($105+ up to 25% off) comes in several colors and has a beautiful drape; I love the dual denim washes of the DL1961 Margaux Instasculpt Ankle Skinny Jeans ($218 + up to 25% off); Rebecca Minkoff’s Berea Cardigan ($348 + up to 25% off) reminds me of old Anthropologie in a good way; Rag & Bone’s Dawson Sweater Coat ($795 + 25% off) is a beautiful car coat; the Kaylen Lace 3/4 Sleeve Dress ($495 + up to 25% off) by Alice + Olivia is one of their many beautiful lace-infused designs and while it’s excluded from Madewell’s current promo, the Transport Tote ($168 + up to 25% off) is included in the Shopbop promo, yay! Many more picks below. Are you shopping this exciting promo? What’s on your wishlist or dream list? This is the first of two posts today — later today we’ll discuss Free People’s sale on sale! Previous Post Here’s your chance to get that Madewell thing you want for less! Next Post Come sale away with Free People, and get an extra 25% off! Sorry I don’t know how to make images in a comment. Sigh. Most of this stuff is way out of my budget. Thanks Roxy for throwing in some budget-friendly items too. That faux suede jacket is near the top of what I can afford it but would be well worth it with the 20% off. Nice that Amazon Prime members get 2-day shipping since they own Shopbop. They run a little big, and they stretch a bit too. I go down one size. Thx – that is what I needed! I am actually thinking of ordering the Black Halo dress (have in the teal color) in another color although Bloomies has it in a long sleeve version. Very flattering for those of us with no waist! I think they run true to size. I only wear the Margaux style jeans though (without rips) and they are my favorite jeans ever. I'm 5'6" 125 and wear a 27. Hope this helps!! Perfect, thanks for that mini fit review Carrie!